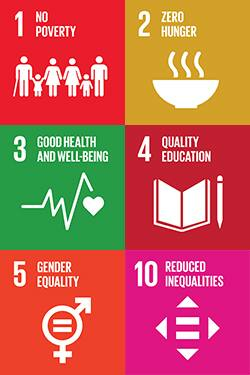 Corporate Sustainability drives our business practices and is a critical aspect of our values and culture. Along with being a signatory to the Women's Empowerment Principles (WEP), our IHS Markit Sustainability Policy and commitment to diversity and inclusion guide us to be a responsible employer and corporate citizen. We are proud of the continued progress in creating a culture of sustainability and a workplace where colleagues are offered excellent benefits and opportunities to grow and thrive. As one of America's 50 most community-minded companies in the 2016 Civic 50, we actively support our communities through philanthropy and citizenship efforts. 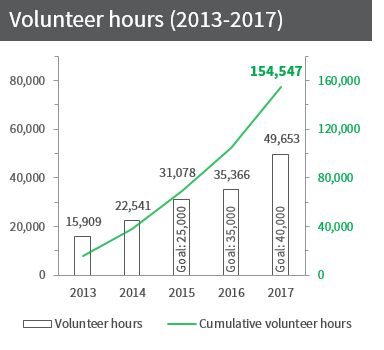 IHS Markit colleagues contributed over 49,000 volunteer hours in 2017. This included efforts in EMEA, APAC and the Americas, supporting local efforts to support education, especially STEM, health and wellness and the environment. IHS Markit colleagues around the globe contribute locally to advance education, the community and the environment. IHS Markit employees are passionate about making a positive impact in their communities. In addition to corporate sponsored events, employees provide support to over 450 organizations and institutions around the world through volunteering, philanthropic giving and in-kind donations. These opportunities reinforce employee engagement company-wide. Introduced in 2013, the annual volunteer benefit offers employees the opportunity to take three days of paid time off to volunteer. With this benefit in place, our employees volunteered more than 49,000 hours in 2017 (a 40 percent increase from 2016). Our 2018 volunteer goal is to exceed 48,000 hours, surpassing 200,000 volunteer hours since 2013. IHS Markit employees are integral to our sustainability efforts, contributing innovative ideas, sharing time for charitable causes, raising awareness and making personal donations. As part of our strategy to advance education in science, technology, engineering and mathematics (STEM), IHS Markit donates a significant amount of our geological, oil, gas and financial software products to universities as in-kind donations. A majority of our donations consist of Petra, Harmony, and Kingdom. Kingdom - a solution that allows geoscientists to make more accurate decisions about where and how to drill for oil and gas - represents 64% of our donations. Visit our Educational Grant Program to learn about the engineering and geological products provided to educational institutions.